Trevor William Hoffman (born October 13, 1967) is an American former baseball relief pitcher who played 18 years in Major League Baseball (MLB) from 1993 to 2010. A long-time closer, he pitched for the Florida Marlins, San Diego Padres, and the Milwaukee Brewers, including more than 15 years for the Padres. He was the major leagues' first player to reach the 500- and 600-save milestones, and was the all-time saves leader from 2006 until 2011. Hoffman was inducted into the Baseball Hall of Fame as part of its class of 2018. He currently serves as senior advisor for baseball operations for the Padres. Hoffman played shortstop collegiately at the University of Arizona and was drafted in the 11th round by the Cincinnati Reds. After not having much success batting, Hoffman was converted to a pitcher, as he was able to throw up to 95 miles per hour (mph). The Marlins acquired him in the 1992 expansion draft, and he pitched in Florida until he was traded to the Padres mid-season in 1993 in a deal that sent star Gary Sheffield to the Marlins. Hoffman recorded 20 saves in 1994 in his first season as Padres closer, and in the following years, he became the face of the franchise after Tony Gwynn retired. He collected at least 30 saves each year for the next 14 years, except for 2003 when he missed most of the year recovering from shoulder surgery. After San Diego did not re-sign him following the 2008 season, Hoffman pitched for two years with the Brewers before retiring after the 2010 season. Hoffman was selected for the All-Star team seven times, and twice he was the runner-up for the National League (NL) Cy Young Award, given annually to the top pitcher in the league. He retired with MLB records of fifteen 20-save seasons, fourteen 30-save seasons (including eight consecutive), and nine 40-save seasons (including two streaks of four consecutive). He also retired with the highest career strikeout rate of any reliever. [note 1] Though he entered the majors with a powerful fastball, an injury after the 1994 season permanently sapped Hoffman's fastball velocity and forced him to reinvent his pitching style; he subsequently developed one of the best changeups in baseball. Hoffman's entrance at home games accompanied by the song "Hells Bells" was popular with fans. After retiring as a player, Hoffman returned to the Padres as a special assistant in the front office. In 2014, he became the team's pitching coordinator at their upper minor league levels, which included working with the Padres general manager. The following year, his role expanded to overseeing pitching instruction at all levels in the minors. Hoffman was born in Bellflower, California. When he was six weeks old, Hoffman had to have a damaged kidney removed because an arterial blockage had formed there. His father, Ed, who stood at 6 feet 2 inches (1.88 m) and 225 pounds (102 kg), was a Marine and a veteran of the Battle of Iwo Jima in World War II. He later became a professional singer before he quit being on the road and got a job at the post office. He was also an usher at California Angels games; he was known as the Singing Usher, leading the crowd in the singing of "Take Me Out to the Ball Game" in the seventh-inning and filling in if the designated national anthem singer did not show up. Ed would often bring Trevor to the games with him. Hoffman's mother, Mikki, was a ballerina and came from an athletic family. Her father was a professional soccer player before World War II. She taught Hoffman to take responsibility. "Bad workmen always blame their tools", Mikki would say. Hoffman's older brother, Glenn, was nine years older and played shortstop in the Boston Red Sox organization. During summer vacation when Hoffman was 10 years old, he joined Glenn while he was playing in Pawtucket. His oldest brother, Greg, was 14 years Hoffman's senior and a mentor to his two younger brothers. After Hoffman's first Little League game, Greg asked him how he did. Hoffman responded, "I went 2-for-4, double, RBI." to which Greg replied, "That'll be the last (blanking) time you tell me how you did. When I ask you how you did, it's how the team did." Hoffman never forgot that. Given their age difference, Hoffman considered his brothers more role models than playmates. "[Glenn] was the guide while Greg was the drill instructor", said Hoffman. Because of his damaged kidney, Hoffman was not allowed to play football or wrestle. Hoffman went to Savanna High School in Anaheim as had Glenn, which put pressure on Hoffman following his more talented older brother. Ed, who did not trust that coaches would protect Hoffman's arm, stopped allowing his son to pitch after he was 12 years old. Standing at just 5 feet 6 inches (1.68 m) and 130 pounds (59 kg), Hoffman played shortstop at Savanna, but nobody offered him a scholarship out of high school. He grew three inches over the summer and continued playing at Cypress College, and later for the University of Arizona from 1988 through 1989. Arizona was afraid of the liability if Hoffman's remaining kidney got hit by a baseball. "I told them the one kidney I have is on my right side. That's not the side that faces the pitcher when I hit, so it was O.K. They bought it", said Hoffman. He led Arizona in hitting in 1988 with a .371 batting average, 35 points better than teammate J. T. Snow. Other notable teammates included Scott Erickson and Kevin Long. Hoffman exhibited a strong throwing arm playing shortstop. Hoffman was selected by the Cincinnati Reds in the 11th round with the 288th overall selection of the 1989 MLB draft, and he signed for $3,000. Prior to the draft, Reds scout Jeff Barton talked to Hoffman about playing another position. Hoffman was open to anything that might advance his career, and they talked about catching or pitching with his exceptional arm. Barton ranked Hoffman's arm an 80 on a 20–80 scale, where 60 was above average and 80 was a rarity. Hoffman played shortstop and third base for the Reds' Single-A affiliate Charleston. In his first 103 games, he only batted .212 with 23 runs batted in. Not showing much batting potential, Hoffman was converted to pitcher in 1991 at the suggestion of Charleston manager Jim Lett, who also grew tired of Hoffman overthrowing first base. Hoffman threw 95 miles per hour (153 km/h) and recorded a 2.90 ERA with 169 strikeouts in ​142 2⁄3 minor league innings over two seasons while alternating between relieving and starting at Single-A Cedar Rapids, Double-A Chattanooga and Triple-A Nashville. Left unprotected by Cincinnati in the 1992 MLB Expansion Draft, Hoffman was selected by the Florida Marlins with the eighth pick in the first round. In his first major league season in 1993, Hoffman learned by observing Marlins closer Bryan Harvey's balanced demeanor. After earning two saves in 29 appearances with the Marlins as an unknown rookie, Hoffman was traded midseason to the San Diego Padres during San Diego's 1993 fire sale. The Padres sent third baseman Gary Sheffield and pitcher Rich Rodriguez to the Marlins for Hoffman and pitching prospects José Martínez and Andrés Berumen. Padres general manager Randy Smith said at the time, "The only way to acquire quality players is to give up quality." The year before, Sheffield had won the NL batting title and made a run at the Triple Crown. Smith insisted that Florida include Hoffman in the deal. Padres fans, upset at the trade, booed Hoffman during his first several appearances. He allowed three runs in his one-inning debut with San Diego, eight runs over his first three outings, and blew his first save opportunity as a Padre. He pitched 39 games for San Diego, who finished the season with 101 losses, and ended his rookie season with 79 strikeouts in 90 innings with a 3.90 ERA and five saves. During the strike-shortened 1994 season, Hoffman took over closer duties from an injured and ineffective Gene Harris in mid-April. Hoffman recorded 20 saves and a 2.57 ERA while averaging 10.9 strikeouts per 9 innings pitched (K/9). The weekend after the strike began, Hoffman, playing Nerf football at Del Mar Beach near San Diego, dived for a pass and landed awkwardly on his right shoulder. He later played volleyball and landed on the shoulder again while going for a dig. He heard a strange sound. In 1995, he had a 3.88 ERA and 31 saves and averaged 8.8 K/9. Hoffman pitched hurt from spring training through the season and finally had off-season rotator cuff surgery. "[Hoffman] never bitched about his arm, which was killing him from Day One ... He was out there when most guys wouldn't have been", said Smith. This is also the year during which he developed his changeup. Petco Park's introduction for Hoffman's entrance during his tenure with the Padres. In both 1996 and 1997, Hoffman pitched over 80 innings, with 111 strikeouts, averaged approximately 40 saves, and had ERAs of 2.25 and 2.66. In 1996, the Padres entered the last three games of the season in Los Angeles trailing the division-leading Dodgers by two games. Hoffman recorded saves in each of the final three games against the Dodgers, as the Padres won the NL West for their first division title in 12 years. After finishing the season with 18 straight saves, Hoffman was named The Sporting News NL Fireman of the Year in 1996, and received votes for both the Cy Young Award and the NL Most Valuable Player (MVP) Award. The Padres played the St. Louis Cardinals in the 1996 National League Division Series (NLDS) and were swept in the series 3–0. Hoffman entered Game 2 with the score tied and one out and inherited runners on second and third. A run scored as he retired the only two batters he faced, and the Padres lost 5–4. In Game 3, Hoffman recorded the loss as he came into the tie game and allowed a 2-run homer to Brian Jordan for a 7–5 loss. The following season on June 23, 1997, he came in with the bases loaded in the ninth inning and struck out J. T. Snow to save the 11–6 win over the San Francisco Giants and became the Padres' career saves leader with 109, passing Hall of Famer Rollie Fingers. San Diego won only 76 games that year, but Hoffman ranked second in the NL with 37 saves. During the 1998 season, Hoffman began entering save situations in Padres home games to the entrance music of AC/DC's "Hells Bells" playing over the public address system, an event that came to be known as "Trevor Time". The tradition began July 25, 1998, and the song was chosen by a Padres salesman. The crowd was excited by the tolling of the bells from the song, and the scoreboard showing Hoffman running in from the bullpen. Hoffman preserved a 6–5 win against the Houston Astros by striking out Moisés Alou to end that game and converted his 41st consecutive save opportunity, tying an MLB record at the time. The following night, Hoffman's streak ended on an Alou home run, though the Padres ended up winning the game. It was Hoffman's only blown save of the regular season. On September 1, he saved a 9–8 victory over the New York Mets for his 45th save, breaking the club record set by Mark Davis in 1989 when he won the Cy Young Award. On September 12, the Padres clinched their second division title in three years after Hoffman saved an 8–7 win over the Dodgers. In a 4–3 win over the Chicago Cubs on September 14, he worked a perfect ninth inning and became the fourth reliever in MLB history to reach the 50-save mark. Hoffman had a career-high 53 saves and a career-best 1.48 ERA. His saves tied the NL single-season record set in 1993 by the Cubs' Randy Myers. Opponents batted .165 against him, and the first hitters he faced hit .129. His ERA in save situations was 0.49, and he struck out 10.6 hitters per nine innings. The Padres were 62–4 in games he pitched. Hoffman was runner-up in the Cy Young Award race that year to Tom Glavine of the Atlanta Braves, despite receiving 13 first-place votes to Glavine's 11. Hoffman was left off of six ballots. Hoffman and Adam Wainwright in 2009 are the only two pitchers to ever receive the most first-place votes and not win the Cy Young. Hoffman won the Rolaids Relief Man of the Year Award and captured another Fireman of the Year Award. He finished seventh in NL MVP voting. Facing the Houston Astros in the 1998 NLDS, the Padres won the series 3–1. Hoffman earned two saves, both in 2–1 wins. In Game 1 against Atlanta in the 1998 National League Championship Series, Hoffman entered to stop a rally in the eighth inning with a 2–1 lead. He allowed a run in the ninth, tying the game 2–2, after converting 53 of 54 save attempts during the regular season. After Padre Ken Caminiti hit a home run in the top of the 10th, Hoffman got two outs but ran into trouble and was taken out after throwing 43 pitches. He was credited with a win as the Padres held on, 3–2. Hoffman entered Game 3 with the bases loaded and two out in the eighth, and he struck out Javy López on three pitches to end the inning and would save the Padres' 4–1 victory. San Diego was up 3–0 in the series and would go on to win 4–2. The Padres reached the 1998 World Series, but lost the series 4–0 against the New York Yankees, who finished with an MLB-record 125 combined regular season and playoff victories and the third-best overall winning percentage (.714) for a World Series champion. In his only appearance in the series in Game 3, Hoffman entered in the eighth with a runner on and no outs and a 3–2 lead. Later in the inning, he surrendered a three-run homer to Scott Brosius, the eventual World Series MVP, and the Padres lost the game 5–4. Hoffman signed a $32 million contract extension with San Diego in March 1999 for the 2000–03 seasons. At the time, it was the richest contract ever given any Padre or any relief pitcher. The Padres held an option for $10 million for 2004. Hoffman's contract included a no-trade clause, the first the Padres had ever granted. Following their World Series appearance in 1998, the Padres lost key players to begin the 1999 season and finished under .500 each season from 1999 through 2002, while finishing either fourth or fifth in the five-team NL West each year. Hoffman saved 56% of the team's wins during that span. He set MLB records with his fifth overall and fourth consecutive 40-save season in 2001, as well as his seventh consecutive 30-save campaign. In 2002, he extended his MLB record with his eighth straight 30-save season. Hoffman was named to the All-Star game in 1999, 2000, and 2002. On June 10, 1999, Hoffman struck out the side in the ninth inning in a 2–1 Padres victory over the Oakland Athletics for his 200th career save. On August 15, 2001, Hoffman recorded his 300th save in a 2–1 home win over the Mets. Hoffman broke Dennis Eckersley's record for most saves with one team (320) in 2002. Sports Illustrated placed Hoffman on the cover of their May 13, 2002 issue with the headline "The Secret of San Diego: Why Trevor Hoffman of the Padres is the best closer (ever)". Hoffman sat out most of the 2003 season while recovering from two offseason shoulder surgeries, including one that trimmed the tip of his scapula. It marked the first time he had been on the disabled list after 10 major league seasons. In his absence, Rod Beck closed for the Padres. Hoffman pitched his first game in 2003 on September 2 with a perfect seventh inning in a 6–3 win over the Arizona Diamondbacks. He pitched in nine games in 2003, all non-save situations, with an ERA of 2.00 and 11 strikeouts in 9 innings. Coming off the injury, the Padres bought out their $10 million option on Hoffman for 2004 for $2 million and agreed to a new deal with a $2.5 million salary for 2004 including $500,000 in incentives and an option for 2005. In the Padres inaugural season at their new home in Petco Park in 2004, Hoffman returned to the closer role and finished with 41 saves with a 2.30 ERA, his lowest since 1998. He passed Jeff Reardon (367) and Hall of Famer Dennis Eckersley (390) to end the season third on the all-time saves list. The new park provide an upgrade over Qualcomm Stadium for "Trevor Time" with a state-of-the-art sound system and new scoreboards with enhanced visuals allowing for animated flames and live fan shots. On May 6, 2005, Hoffman saved a 6–5 win over the St. Louis Cardinals as the Padres won two straight in St. Louis for the first time since 1977. It was Hoffman's 400th save, and he became the third pitcher in MLB history to reach the milestone, following John Franco (424) and Lee Smith (478). Hoffman was named both the NL Pitcher of the Month and Delivery Man of the Month in May after a perfect 12 for 12 in save opportunities while posting a 0.82 ERA (1 ER/11.0 IP) in 12 games as the Padres went 22–6 for their best month in franchise history. On August 24, Hoffman converted his 29th consecutive save opportunity in a 7–4 win over the Houston Astros. He passed Franco for second place on the all-time saves list with his 425th save, and the Padres maintained a six-game lead in the NL West with a 63–63 record. The Padres won the NL West with an 82–80 record, and Hoffman finished the season 43 for 46 in save opportunities, the second most saves in the NL. The Padres were swept 3–0 in the playoffs by the Cardinals, who had a majors-best 100–62 record in the regular season. Hoffman did not get into any save situations as the Padres never led through any of the 27 innings in the series. As a free agent after the 2005 season, Hoffman re-signed with the Padres after negotiating with the Cleveland Indians. Hoffman signed a $13.5 million, two-year contract that included a club option for 2008. "It came down to me making a decision for my family and not disrupting what we have going on", said Hoffman. "This is probably the most significant signing that I've had", said then-Padres general manager Kevin Towers. "This guy is the face of our organization. I can't put into words what he means to our community." Baseball from Hoffman's then-record 479th save. In 2006, Hoffman was named to his fifth All-Star game, but was the losing pitcher in the game after having two strikes with two outs to Michael Young, who was later named the All-Star Game Most Valuable Player. His All-Star performance bothered him, and he suffered two of his five blown saves that year in the week that followed. August 20 marked Hoffman's 776th outing for the Padres, breaking the Pirates Elroy Face's major league record for most relief appearances with one club. On September 24 in the Padres last home game of the year, Hoffman retired eventual 2006 NL batting champion Freddy Sanchez for the final out of a 2–1 win over the Pittsburgh Pirates, keeping the Padres ​1 1⁄2 game lead atop the NL West with seven games left to play. With the save, Hoffman became the all-time Major League saves leader, surpassing Lee Smith's record of 478. As the Padres celebrated on the mound with Hoffman, the Pirates remained in the dugout watching in respectful salute. "I've never seen a crowd get into one inning for one guy like that before", said Pirates reliever John Grabow. "You get goose bumps even if you are on the other team." The Padres presented Hoffman with a golden bell trophy, a reference to "Hells Bells". Hoffman saved a 3–1 win over the Diamondbacks on September 30 as the Padres to clinched a playoff berth. The next day in the last regular season game, two home runs were hit off Hoffman before he saved a 7–6 win over the Diamondbacks, earning the Padres their second consecutive NL West title. He was named MLB Delivery Man of the Month for September after being 10 for 11 in save opportunities and striking out 13 batters over 12.0 innings and allowing only seven hits. Hoffman saved 46 of 51 save chances on the year, and led the NL in saves for the second time. His 11th 30-save season set an MLB record, while his eighth 40-save season extended his record. His season save total was the second highest in his career. Hoffman won the Rolaids Relief Award for the second time in his career, was awarded The Sporting News NL Reliever of the Year for the third time, and finished as the runner-up for the Cy Young Award for the second time. In the playoffs, the Padres faced the Cardinals in the NLDS again. Down 2–0 in the series, Hoffman saved Game 3 in a 3–1 win to avoid elimination. However, the Padres lost the series 3–1 as their offense managed only six runs in the four games against the eventual 2006 World Series champions. Hoffman was first major leaguer to reach 500 saves. On April 28, 2007 in a 3–2 win over the Dodgers, Hoffman earned a save and pitched in his 803rd game for the Padres, breaking the MLB record for games pitched for one team. The record was previously held by both Walter Johnson of the Washington Senators and Elroy Face of the Pittsburgh Pirates. On June 6 against the Dodgers, Hoffman became the first pitcher in MLB history to log 500 saves after the Padres' 5–2 victory. Hoffman was awarded the MLB Delivery Man of the Month for May after converting all 11 of his save opportunities and allowing no earned runs in 13 games. On July 1, Hoffman was named to the NL All-Star Team for the sixth time in his career. On September 8 against the Colorado Rockies, Hoffman struck-out Todd Helton swinging on a 74-mph change-up for his 1,000th career strikeout, becoming the eighth reliever to reach the mark. On September 27, Hoffman picked up his 40th save of the 2007 season, marking his ninth season with 40 saves, a Major League record. On September 29, one strike away from clinching the Padres third consecutive playoff berth, Hoffman surrendered a tying, two-out triple in the ninth inning to Tony Gwynn, Jr., son of legendary Padres Hall of Famer Tony Gwynn. The Padres would lose 4–3 in the 11th inning to the Milwaukee Brewers. On October 1, in the Padres' wild card tie-breaker game against the Rockies, Hoffman blew his second straight save opportunity and his team's 8–6 lead in the 13th inning. He took the loss when he allowed the game-winning run to score on a sacrifice fly. For the season, he converted 42 saves in 49 opportunities while posting a 4-5 mark and 2.98 ERA. His 42 saves were the third most in the NL. A couple of weeks after the end of the season, Hoffman had minor arthroscopic surgery on his pitching elbow to remove bone chips. He said it was unrelated to his pitching performance at the end of the season. Hoffman surrendered a home run but recorded his 550th save on August 14, 2008 in a 3–2 victory over the Brewers. On September 19, 2008, Hoffman finished an 11–6 14-inning win over the Washington Nationals for his 900th career MLB game. Hoffman's 30th and last save of the season, a 3–2 win over the Pirates, ensured the Padres would not lose 100 games that season. The Padres finished with a 63–99 record after being projected by the team and analysts to win 87–90 games. Hoffman ended the 2008 season 3–6 with a 3.77 ERA and 30 in 34 save opportunities. He tied for sixth in the NL in saves. Hoffman reached 20 or more saves for the 14th time to set a new MLB record. He had a 5.14 ERA through his first 29 appearances and a 1.56 ERA in his last 19 appearances of the season. Hoffman, eligible for free agency, realized he was decreasing his leverage when he declared he wanted to return to play for San Diego in 2009 and did not want to move his family. Meanwhile, Padres owner John Moores, who was in the midst of a divorce and in the process of selling the team, ordered the team to reduce its payroll from its 2008 budget of $73.6 million to $40 million. It was announced on November 10, 2008, that Hoffman would not return to San Diego in 2009. With his struggles during the season, the cost-cutting Padres lowballed a $4 million offer with an option for 2010 and later retracted that, ending his tenure with the team. It was not an amicable parting for Hoffman, who was the face of the franchise after Tony Gwynn's retirement following the 2001 season. His 902 career appearances as a Padre extended his own MLB record for games pitched with one team. On January 13, 2009, Hoffman signed a one-year, $6 million deal with the Milwaukee Brewers. He suffered a strained muscle on the right side of his rib cage in Spring training, and started the season on the DL. He made his Brewers debut on April 27, 2009. Hoffman recorded his first save for Milwaukee the next day, and the Brewers continued with his "Trevor Time" entrance. He was named NL Pitcher of the Month as well as MLB Delivery Man of the Month in May after recording 11 saves in 12 scoreless appearances in the month. He started the season with 18 scoreless innings before entering in a tie game on June 14 and surrendering a run in a 5–4 loss against the Chicago White Sox. Hoffman was selected as an All-Star in 2009 as a late replacement, making his seventh appearance. [note 2] On September 3, he struck out Albert Pujols on three pitches for his 30th save in the 4–3 win over St. Louis. The save extended Hoffman's record to 14 seasons with at least 30 saves. He had already increased his record of 20 or more saves to 15. Hoffman appeared in 55 games with the Brewers, recording 37 saves in 41 attempts with a 1.83 ERA and a .183 BAA. It was second lowest ERA of his career behind 1.48 in 1998 in San Diego, and he ranked fifth in the NL in saves. In the offseason, he re-signed with the Brewers for $8 million for 2010 with a mutual option for the 2011 season. With less control on his changeup, Hoffman struggled in 2010. In April, Hoffman pitched nine innings and allowed 13 earned runs and six home runs—surpassing his totals in both categories from all of the previous season—and he blew four of his seven save opportunities. Historically though, Hoffman had blown 20 of 84 save attempts in April for his career, a 76.1 percent success rate, while converting 90.6 percent the rest of the season. On May 1, Hoffman earned his first save at Petco Park as a visitor, as the Brewers beat the Padres 2–1. After saving just five of his first 10 chances with an ERA over 12.00 in mid-May, Hoffman's struggles prompted Brewers manager Ken Macha to remove him as closer and move him into middle relief to work on his mechanics. Hoffman insisted that there was nothing physically wrong with him, and he served as a mentor for his replacement, John Axford. Stuck at 596 career saves before his demotion, Hoffman eventually returned to a setup role, and occasionally pitched in save situations. On September 7, 2010, he recorded his 600th save, and he was carried off the field by his teammates. "To be a part of it was great because of how much admiration we all have for Trevor", said teammate Craig Counsell. Hoffman finished the season win a 2–7 win–loss record, 10 saves in 15 chances, and a 5.89 ERA in 50 appearances, but he allowed just nine earned runs in his final 33 appearances dating back to June 3. He and the Brewers parted ways on November 2 when the club declined to exercise a $7 million mutual option on his contract. In the offseason, Hoffman expressed interest in taking over the closer role for a team near his home in San Diego, but he did not wish to return as a setup pitcher and diminish his accomplishments. The Arizona Diamondbacks, where old friend and former Padres general manager Kevin Towers was the GM, considered Hoffman a backup option as their closer had they not managed to sign J. J. Putz. Hoffman believed he could still pitch in the big leagues, but with all of the closer roles for West Coast teams filled, He elected to retire, announcing his decision on January 11, 2011. He revealed that elbow tendinitis plagued him for most of the first half of 2010, though he never used it as an excuse for his performance. Hoffman had received three cortisone injections that year with the Brewers. Hoffman retired with 601 saves as the all-time saves leader in MLB history. He had no desire to sign a ceremonial one-day player contract to retire as a Padre. "I don't believe that's the right way [to retire]", said Hoffman. The Padres retired Hoffman's No. 51 at Petco Park in a pre-game ceremony on August 21, 2011, against the Florida Marlins. San Diego Mayor Jerry Sanders declared it "Trevor Hoffman Day." The ceremony was patterned after the show This Is Your Life, featuring over 40 of Hoffman's former teammates and coaches. Brian Johnson, the lead singer on AC/DC's "Hells Bells", paid tribute in a video to Hoffman for "rocking the mound." In a nod to Hoffman's late father, Ed, the Padres presented Hoffman with a mint condition 1958 Cadillac convertible; his father loved driving his family in a convertible. For the National Anthem, the Padres played a video of Ed singing "The Star-Spangled Banner" at Fenway Park on Opening Day in 1981 when Hoffman's brother, Glenn, was the starting shortstop for the Red Sox. In 2014, Hoffman became the ninth inductee into the San Diego Padres Hall of Fame. He became eligible for induction into the National Baseball Hall of Fame starting in 2016. In his debut, he fell short of the 75 percent of votes required for entry, but the 67.3 percent he received as a first-year candidate was promising for induction in the future. In 2017, Hoffman received 74 percent of the vote, falling five votes short of induction. On January 24, 2018, Hoffman was elected into the Baseball Hall of Fame with 79.9 percent of the vote. Soon thereafter, the Padres announced plans to unveil a bronze statue of Hoffman at Petco Park sometime around his July 29 induction into the Hall of Fame. Hoffman was known for his high leg kick, the menacing glare through his cap pulled down almost to his eyes, and his deceptive changeup. When Hoffman first came into the league, he could throw up to 95 mph. He would also throw a slider and only an occasional changeup. His original changeup was a conventional circle changeup taught to him by Cincinnati scout Larry Barton. Hoffman learned a different changeup, which he throws with a palmball grip, from teammate Donnie Elliott in 1994. He began using the new changeup in 1995 when his fastball had dropped to 88–90 mph after his offseason injury on the beach. With the decrease in velocity, Hoffman knew he could not rely as much on his fastball. He played through 1995 and had surgery the following offseason for a torn rotator cuff. When he returned the following year, Hoffman's fastball was at 87–88 mph, but he had more experience with his new changeup. His fastball reached back as high as 91 mph in 1998, but by sometime after 2000 it dropped down to 83–88 mph. His repertoire by then included primarily of his changeup, a four-seam fastball, a slower cut fastball that moves in towards a left-handed batter, and the occasional slider and a curveball. Hoffman explained the key to his changeup was how he pinched the seam of the ball with his thumb and index finger as he released it. He threw the changeup with the arm speed used to throw a fastball, and the spin and movement of the ball looked the same to the batter. His changeup ranged from 73–76 mph. Bruce Bochy, who managed Hoffman for over a decade with the Padres, said of Hoffman's changeup: "He pitched so well off his fastball [opponents] couldn't just sit on it every pitch." "You could be sitting on [his changeup] and still not be successful with it", says former player Mark Sweeney. It was the arm action on the change up and the late sink just before it reached the plate that allowed Hoffman to stay successful over the years. With opponents flailing to slow down their swings, teammates nicknamed Hoffman's changeup The Bugs Bunny Pitch after a famous Bugs Bunny cartoon episode. "Some [pitchers] fool you. Some guys overpower you. Hoffman embarrasses you", said former rival and later teammate Mike Piazza. After striking out on a changeup to end the game against Hoffman, Dodger catcher Paul Lo Duca said, "It's like it has a parachute on it." As Hoffman lost velocity on his fastball throughout his career, he compensated by maintaining a notable speed differential between that pitch and his changeup. He initially kept the grip of his changeup a secret. "I was a little weird about it", Hoffman said. "I didn't like talking about how I threw the change. I didn't want people to see how I gripped the ball. I thought I'd be giving away something to the hitters." Later in his career, he posed for pictures of his grip, figuring everyone had seen it. Padres general manager Kevin Towers said Hoffman was the first one in and the last one out of the ballpark everyday. Hoffman adhered to a daily conditioning program. When pitcher Jeremy Fikac was promoted to the majors in 2001, Hoffman invited him to join him on his usual afternoon run. "I remember sitting in the bullpen that night, and my legs were still trembling from the run", Fikac recalled. "I'd run before, but not at that pace ... I was thinking, I hope they don't call on me because I can't feel my legs under me ... His work ethic is unbelievable." Bochy said, "[Hoffman's] one of those guys like Tony Gwynn—they never feel like they've arrived. Tony never thought, 'Well, I'm hitting .360 ... ' He was never content. And Trevor's the same way. They just keep working and make sure that they've got goals they want to reach." After every save opportunity, whether he converted it or blew it, Hoffman would sit in the dugout for up to five minutes after his teammates had cleared out. Whether it was the euphoria from success or the sting of failure, he would sit there and drain all the emotion out of himself, put the game behind him, and move on. Tracy Hoffman said, "He's all about order. That's the foundation to what he does. You see it when he's on the field. He's always the same, win or lose. He doesn't smile, doesn't show any emotion." Padres manager Bud Black marveled at Hoffman's regimen. "The daily preparation for his job, that focus and dedication each day to prepare for the ninth inning ... It was incredible to see live", said Black. "I played with George Brett, a Hall of Famer who was a great worker. But Trevor took it to a level and a commitment and Hall of Fame caliber." After Hoffman resurrected his final season and recorded his 600th save, Macha said Hoffman's "work ethic and perseverance paid off ... He had to grind it out to get there." Hoffman was long regarded as one of the great teammates in baseball. He was known as a leader in the clubhouse and a tutor to younger players. He mentored his successor in San Diego, Heath Bell, and the pitcher who supplanted him in Milwaukee, John Axford. "Just watching him go about his business was a big thing to me", Bell said. In his first game pitching setup to Axford after losing his closer role, Hoffman stayed in the dugout to watch Axford finish. Many relievers retire back to the clubhouse after being removed from a game. Hoffman's teammates noticed that he stayed supporting Axford through a bases-loaded jam. Axford spent the season absorbing Hoffman's advice, and the two bonded. "He took young players under his wing, especially relief pitchers", said former Padres teammate Brad Ausmus. Hoffman regularly organized team dinners on the road or had team family gatherings at his home, whether it was with the Padres or the Brewers. "It's very unusual for a pitcher, especially a relief pitcher, to be the team leader", Padres first baseman Phil Nevin said in 2002, "but everybody here looks to Trevor. This is his team." According to Ausmus, Hoffman wanted his teams to feel like a family. He felt like he let his family down if he did not do his job on a particular night. Still, he was accessible and held himself accountable on the rare occasions that he failed. Hoffman was more accommodating for interviews after blown saves than he was after successful ones. "The people asking the questions are not responsible for the ball flying out of the park", he explained. Both Towers and Black best remember Hoffman for his accountability after his blown save in the 2007 Wild Card tie-breaker. "My greatest memory of Trevor is from game No. 163 in 2007. Seeing his passion for the Padres, his love for his teammates, and his devastation over the loss and then handling each reporter's question with the utmost class and professionalism ranks as my greatest sports memory. How he handled that incredible loss says more about him than any save could. Life is about how you handle adversity and what he demonstrated that night was just remarkable. Baseball people revere Hoffman for how he treats people. Ausmus says Hoffman goes out of his way to engage fans. Beyond shaking hands or signing autographs, he has extended conversations with fans who want to talk baseball. When Hoffman passed on the Indians in free agency to stay with the Padres, he still sent an autographed jersey as a baby gift to then-Indians manager Eric Wedge. After Hoffman saved the game to clinch the NL West on the last day of the 1996 season, he called Randy Smith, who traded for Hoffman as Padre GM before moving on to the Detroit Tigers. "Randy, I wish you were here", Hoffman said. "You're a part of this." While celebrating his record setting 479th save against the Pirates, Hoffman tipped his cap to the Pittsburgh dugout, particularly Pirates manager Jim Tracy, who managed Hoffman in Cincinnati's Double-A Chattanooga farm team in 1991 after he was converted to a pitcher. Despite losing his role as a closer in his final season, Hoffman took pleasure in supporting his teammates and "not being a cancer just because I was having trouble." "Every boy who grows up dreaming of playing Major League Baseball, has a similar vision of what it would be like, and what they would be like as a player. They would imagine that they were a great player. They would stake claim to being an All-Star, and playing in front of packed stadiums. They would imagine signing autographs, and would always treat the fans well, and that the fans would return the favor. There would be images of teammates that loved them and revered them. And, that when they became superstars, they would always remember that they were just a regular person, like everybody else, no better. They might even dream of making the Hall of Fame one day. Now, I may not have quite lived up to that dream, but I am proud to say I am friends and played with the guy who stayed true to every bit of it ... Trevor Hoffman." Hoffman dominated his position at a consistent level while enjoying incredible longevity over almost two decades. After an 18-year career, the seven-time NL All-Star retired as MLB's all-time leader in saves with 601. He was the first pitcher to reach not only the 500 save milestone, but also 600. He converted 88.8 percent of his save opportunities, the third-highest rate among players with 300 or more saves. Barry Bloom of MLB.com called Hoffman "the best National League closer of his era." Hoffman is one of only three pitchers who have had streaks of four straight seasons with at least 40 saves;[note 3] he achieved it twice. His nine seasons of 40 or more saves are tied for the most all-time. He became one of the Padres' most-popular players. His 15-year stint as their closer was rare for a baseball role that exhibited a high turnover rate. Hoffman had 12 seasons with at least 37 saves, 13 seasons with a sub-3.00 ERA and 14 with an ERA+ of at least 130 (indicating that he was at least 30 percent better than the league average in ERA those years). Four times he was in the top six in voting for the Cy Young Award, including twice as a runner-up. Among pitchers to debut since 1969, he is one of only two ranked in the top 10 for lowest opponents' batting average against facing both lefties and righties. [note 4] Hoffman retired ranked first with 856 games finished, ninth with 1,035 games pitched, seventh-lowest in hits per nine innings (H/9) at 6.99, and seventh-best in strikeout-to-walk ratio (K/BB) of 3.69. He had a 2.87 ERA and 1.06 walks plus hits per inning pitched (WHIP) for his career. Though he was not a power pitcher, Hoffman was a strikeout pitcher. His 9.36 K/9 was the fifth-highest in MLB history, and highest ever among relievers. [note 1] Sports journalist Fran Zimniuch wrote in Fireman: The Evolution of the Closer in Baseball that Hoffman was "a thinking man's closer, using guile rather than heat." As the velocity of his fastball decreased, he compensated with a devastating changeup that is as synonymous a pitch with Hoffman as the splitter is with Bruce Sutter or the cutter is with Mariano Rivera. "It's a tough situation throwing a change-up in the ninth inning, unless you've got Trevor's changeup", closer Billy Wagner said. "There's not many guys who have a changeup that's dominating", All-Star third basemen Scott Rolen said. "But his is dominating. It's a weapon. That's not usually a word you use with a changeup." Robb Nen, a retired closer, was amazed at how Hoffman got better after he lost velocity on his fastball. "I don't think I could do it, to just lose the ability to throw 95 and still be one of the best. I have tremendous respect for him", Nen said. Another retired closer, Troy Percival, concurred about the difficulty in transforming from a power pitching style. "It's not easy to do. Guys who throw 95, 96 [mph] have an ego about being able to do that. [Hoffman] just went right into, 'Hey, you know, I throw 87 now. This is what I've got.' And he goes out there and gets it done just as well as he ever did." [Hoffman is] unique in the sense that what he does, closing, is usually a power pitcher's game. His change-up isn't just great, but dominating. What he does puts things in perspective. It's pitching, not just throwing, and using whatever stuff you have. He throws a pitch that looks so tempting that you can't lay off it. ... I feel vulnerable when I throw 93-96 mph. He's throwing 81 and doing it with full confidence. During the time Hoffman held the career record for saves, many still considered Rivera the best closer of all time. Like many other relievers of his era, Hoffman was compared to Rivera and his success in the playoffs. While Hoffman had 601 regular-season saves, he only had four in the playoffs along with a 3.46 postseason ERA. He lacked the postseason opportunities and success of Rivera, who had 42 saves and an 0.70 ERA in the playoffs as the Yankees advanced to the postseason 17 times and won five World Series during his career. During Hoffman's tenure in San Diego, the Padres won at least 90 games only twice and had nine losing seasons, including five with no more than 70 wins. Hoffman, however, did blow a save opportunity in his only World Series appearance and also failed on save tries twice in the final three days of the 2007 season as the Padres vied for the playoffs. Rivera broke Hoffman's career save record in 2011, and finished his career with 652. In 2014, Major League Baseball introduced the Trevor Hoffman National League Reliever of the Year Award, which is awarded annually to the top reliever in the NL. Hoffman was elected into the Baseball Hall of Fame in 2018, becoming the sixth member to be elected who was primarily a reliever during their career. Zimniuch wrote that Hoffman and Rivera are "the best of the best of the one-inning closers". Less than 10 percent of Hoffman's saves were over one inning. Closers as a whole have been criticized for pitching almost exclusively in the ninth inning with no runners on base, while star relievers previously were called firemen, entering games in the middle of innings with runners on base and capable of pitching multiple innings. After Hoffman retired, saves became devalued as a primary evaluator of closers, and his career numbers—including sabermetric statistics like Wins Above Replacement (WAR), Win probability added (WPA), and Jaffe Wins Above Replacement Score (JAWS)—were more heavily scrutinized than for relievers elected before him. Still, his large volume of saves made him a strong candidate for the Hall of Fame. Some opponents of his induction maintained that his limited innings mitigated his impact compared to starting pitchers who have not been inducted, while others posited that those starters could have excelled as closers, but Hoffman would not have succeeded as a starter. Hoffman pitched ​1,089 1⁄3 innings in his career, which topped only Sutter (1,042) among pitchers in the Hall of Fame. The two are the only Hall of Fame pitchers who never started a game. "Trevor Time" continued with the Brewers. Hoffman's entrance into games, accompanied by the playing of "Hells Bells", became popular among fans after it was introduced in 1998. Tom Verducci of Sports Illustrated wrote that Hoffman's "signature moment is one of the most electrically charged in sports: Padres fans rising and roaring, in Pavlovian fashion, upon hearing the first bell toll, the foreboding bonging like something out of Hitchcock as Hoffman enters slowly, stage right." Opposing closer Jason Isringhausen said, "'Hells Bells' in San Diego is Trevor. It's like when you go there, you want to [win] two out of three so you can hear it once." The initial introduction of Hoffman's entrance music was a forerunner in the heavy metal closer theme songs used throughout home stadiums. The San Diego Union-Tribune initially noted, "[Hoffman's] entrance was more suited to the World Wrestling Federation than the national pastime." By the end of Hoffman's career, San Jose Mercury News and ESPN.com wrote that the song should be honored by the Baseball Hall of Fame. Other teams contacted the Padres for videos of the "Trevor Time" production. Yankees executives witnessing Hoffman's entrance in 1998 were inspired to use the song "Enter Sandman" for Rivera's entrance starting the following season. Hoffman in Padres camouflage uniform. Coinciding with his retirement from playing in 2011, Hoffman returned to San Diego as a special assistant to Padres team president and COO Tom Garfinkel. "There's been a turnover of people [in the Padres front office] who wanted to reconcile and I've been cool with it. A couple of years definitely makes a big difference", said Hoffman. In addition to his front office role, he also served as an instructor during spring training. In 2014, Hoffman became San Diego's upper-level pitching coordinator, essentially an additional pitching coach for the Padres at their Double-A and Triple-A levels. His new role also involved assisting San Diego general manager Josh Byrnes. Under General Manager A. J. Preller in 2015, Hoffman became senior advisor for baseball operations, overseeing pitching instruction at all levels of the Padres' minor league system. Hoffman, whose mother was born in England, was the bullpen coach for the Great Britain team during the qualifying round of the 2017 World Baseball Classic. Hoffman met his wife, Tracy, in Buffalo, New York in 1992 where she was a real estate agent and a member of the National Football League's Buffalo Bills cheerleading squad. He asked her to marry him in 1993 while she was on the field during Super Bowl XXVII, which the Buffalo Bills lost to the Dallas Cowboys, 52–17. Hoffman and his wife have three sons: Brody, Quinn, and Wyatt. Hoffman's father died of cancer on Super Bowl Sunday in 1995. Hoffman donated $200 for every save to the National Kidney Foundation. In honor of his father, a former Marine, Hoffman annually paid for game tickets and meals for 1,000 members of the military and their families. ^ Keith Sharon (28 July 2018). "Hall of Famers Vladimir Guerrero, Trevor Hoffman show baseball's place in Orange County's heart". Orange County Register. Retrieved 31 July 2018. On Sunday, Guerrero and Trevor Hoffman will join Alan Trammell, Jack Morris, Chipper Jones and Jim Thome as the 2018 inductees into the National Baseball Hall of Fame in Cooperstown, New York. ^ a b c d e f g h i j k l m Olney, Buster (September 11, 2006). "Change Artist: How did Trevor Hoffman go from a scrawny Minor League shortstop with one kidney to a hall of fame closer? He got a grip". ESPN The Magazine. Archived from the original on January 24, 2011. Retrieved January 23, 2011. ^ a b c d Krasovic, Tom (March 20, 1996). "Hoffman takes heart when he takes the mound". The San Diego Union-Tribune. Archived from the original on February 9, 2011. ^ Center, Bill (August 21, 2011). "National anthem touching finale to Trevor Hoffman's day". The San Diego Union-Tribune. Archived from the original on August 22, 2011. ^ a b Center, Bill (2007). Padres Essential: Everything You Need to Know to Be a Real Fan!. Triumph Books. p. 122. ISBN 1-57243-956-4. ^ a b c Jenkins, Chris (September 26, 2006). "Rooted in success". The San Diego Union-Tribune. Archived from the original on March 5, 2011. ^ a b c d e f g h i j k l m n o p Verducci, Tom (May 13, 2002). "Case Closed". Sports Illustrated. Archived from the original on January 29, 2011. ^ a b c d e f g h i j Etkin, Jack (July 2006). "Trevor Hoffman: closing in on saves record: San Diego reliever's rise to stardom has been an unassuming one of hard work, loyalty and sportsmanship". Baseball Digest. pp. 52–56. ISSN 0005-609X. With his high leg kick and cap pulled down almost to his eyes, Hoffman looks the part of someone about to wring the last bit of life out of the opposing team. ^ Canepa, Nick (August 20, 2011). 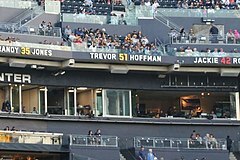 "Trevor's time: Hoffman getting number retired". The San Diego Union-Tribune. Archived from the original on August 21, 2011. ^ a b c d e f g h Jaffe, Jay (December 18, 2015). "JAWS and the 2016 Hall of Fame ballot: Trevor Hoffman". Sports Illustrated. Archived from the original on January 1, 2016. ^ a b c d e Filice, Genarro (July 1, 2005). "Exception to the rule". SI.com. Archived from the original on February 8, 2011. ^ Willis, Blair (2010). 2010 Arizona Baseball Media Guide (PDF). Tempe, Arizona: Ben Franklin Press. p. 64. Archived from the original (PDF) on March 1, 2011. ^ Kurkjian, Tim (June 10, 1996). "A Short Fuse". Sports Illustrated. Archived from the original on March 1, 2011. ^ Shpigel, Ben (October 7, 2010). "As Yankees' Most Valuable Repairman, Long Revives Struggling Hitters". The New York Times. p. B17. Archived from the original on March 1, 2011. ^ Krasovic, Tom (August 17, 2011). "Hoffman was a hidden gem in Draft". MLB.com. Archived from the original on August 21, 2011. ^ Brock, Corey (January 12, 2011). "Hoffman's scout saw special arm in shortstop". MLB.com. Associated Press. Archived from the original on February 15, 2011. ^ a b c d Wilson, Bernie (January 12, 2011). "Hoffman retires after 601 saves in 18 seasons". The San Diego Union Tribune. Associated Press. Archived from the original on January 23, 2011. Retrieved January 23, 2011. Hoffman was converted from shortstop to pitcher in the minor leagues when his manager got tired of him overthrowing first base. ^ Schlegel, John (January 12, 2011). "In every respect, Hoffman finished strong". MLB.com. Retrieved January 23, 2011. After two years in the Minors and not much batting potential to show for it, his manager Jim Lett suggested Hoffman try pitching instead, because he had such a strong arm. ^ a b c d e Wilson, Bernie (January 11, 2011). "All-time saves leader Trevor Hoffman retires at 43". The San Diego Union Tribune. Associated Press. Archived from the original on January 23, 2011. Retrieved January 23, 2011. Hoffman was acquired as a rookie from the Florida Marlins in 1993 during the Padres' infamous "Fire Sale" that stripped away most of their high-paid veterans. ^ Kernan, Kevin (June 24, 1993). "Sheffield, Rodriguez traded to Marlins for three pitchers". The San Diego Union-Tribune. Archived from the original on February 9, 2011. ^ Olney, Buster (September 20, 2011). "True stories of Mariano and Trevor". ESPN The Magazine. Archived from the original on October 12, 2011. ^ Jenkins, Chris (August 29, 2014). "Seven major moments for Trevor Hoffman". U-T San Diego. Archived from the original on August 31, 2014. ^ Olney, Buster (April 14, 1994). "Harris 'cool' with Riggleman; Hoffman takes over as closer". The San Diego Union-Tribune. Archived from the original on February 16, 2011. ^ Nightengale, Bob (September 27, 1996). "SHOWDOWN, Part II (Dodgers and Padres)". Los Angeles Times. Archived from the original on February 16, 2011. ^ a b "1996 Season Recap". padres.com. Archived from the original on February 16, 2011. ^ "Trevor Hoffman 1996 Pitching Gamelogs". Baseball-Reference.com. Retrieved September 10, 2010. ^ Chandler, Bob; Swank, Bill (2012). Bob Chandler's Tales From The San Diego Padres Dugout: A Collection of the Greatest Padres Stories Ever Told. Skyhorse Publishing. p. 241. ISBN 978-1-61321-088-8. ^ Fallstrom, R. B. (October 4, 1996). "Eckersley Put 'Em Down in Order, Preserves Win". Deseret News. Associated Press. Archived from the original on March 4, 2011. ^ "October 3, 1996 National League Division Series (NLDS) Game 2, Padres at Cardinals". Baseball-Reference.com. Archived from the original on March 4, 2011. ^ "Sophomore Brian Jordan's glove and bat fuel St. Louis sweep". MLB.com. October 5, 1996. Archived from the original on March 4, 2011. ^ "Finley's 3 Homers Power Padres, 11-6". Los Angeles Times. Associated Press. June 24, 1997. Archived from the original on February 16, 2011. ^ a b c d Tarantino, Anthony (April 19, 2004). "For whom the bell tolls: Who'd have thought 'Trevor Time' would start a majorswide trend?". San Diego Union-Tribune. Archived from the original on September 12, 2011. ^ a b c d Chandler, Bob (2007). Bob Chandler's Tales from the San Diego Padres. Sports Publishing LLC. pp. 129–130. ISBN 978-1-59670-224-0. Retrieved January 22, 2011. On July 25, 1998, a tradition began that continues to thrill crowds at Petco Park." ^ Lockwood, Wayne (July 26, 1998). "Pain of 'Fire Sale' now brings relief". The San Diego Union-Tribune. p. C-1. The Padres have taken to announcing Hoffman's entrance into the ballgame with a scoreboard shot of him running in from the bullpen, accompanied by the tolling of bells. ^ "Padres Survive a Rough One". Los Angeles Times. Associated Press. September 2, 1998. Archived from the original on February 16, 2011. ^ Reid, Jason (September 13, 1998). "T-Shirts Aren't Only Giveaway as Padres Win West". Los Angeles Times. Archived from the original on February 17, 2011. ^ a b c d e "1998 Season Recap". padres.com. Archived from the original on February 16, 2011. ^ a b Center, Bill (March 9, 1999). "Hoffman becomes best-paid reliever". The San Diego Union-Tribune. Archived from the original on February 17, 2011. ^ "BASEBALL; Glavine Takes N.L. Cy Young for 2d Time". The New York Times. November 18, 1998. Retrieved January 22, 2011. In the closest balloting for the award since 1987, Hoffman, the San Diego closer, received 13 first-place votes, but fell 11 points short of Glavine, who got 11 votes for first place, but appeared on three more ballots. ^ a b Whicker, Mark (January 12, 2011). "Hoffman's impact still felt in San Diego". The Orange County Register. Archived from the original on February 15, 2011. ^ Hart, Chris (November 19, 2009). "Lincecum's the one; that makes two Cys". MLB.com. Retrieved January 22, 2011. Wainwright became only the second pitcher to garner the most first-place votes and not win the award. In 1998, Atlanta's Tom Glavine collected 11 first-place votes to 13 for San Diego's Trevor Hoffman but amassed the most points, 98-88, and took home the trophy. ^ Newhan, Ross (September 30, 1998). "Powerful Astros Are Shut Down By a Brown Out". Los Angeles Times. Archived from the original on March 5, 2011. ^ Newhan, Ross (October 4, 1998). "Leyritz Still Has Magic Bat in Postseason". Los Angeles Times. Archived from the original on March 5, 2011. ^ Reid, Jason (October 8, 1998). "Padres Get By Braves". Los Angeles Times. Archived from the original on March 5, 2011. ^ a b Newhan, Ross (October 11, 1998). "Padre Pitchers Are Making Waves to Ride". Los Angeles Times. Archived from the original on March 5, 2011. The closer ultimately delivered 43 pitches in a stint of two-plus innings, but Brown's nine-inning effort in Game 2 and Friday's day off, Hoffman said, gave his arm a chance to recover. ^ "October 7, 1998 National League Championship Series (NLCS) Game 1, Padres at Braves". Baseball-Reference.com. Retrieved March 5, 2011. ^ "1998 WORLD CHAMPIONS -- A SEASON TO REMEMBER". The New York Times. October 23, 1998. Archived from the original on March 5, 2011. ^ Reid, Jason (October 21, 1998). "Padres Not Off Scott-Free". Los Angeles Times. Archived from the original on March 5, 2011. ^ Chass, Murray (February 3, 1999). "BASEBALL; San Diego Trades Vaughn To Cincinnati for Sanders". The New York Times. Archived from the original on February 22, 2011. ^ "San Diego Padres Team History & Encyclopedia". Baseball-Reference.com. Retrieved February 22, 2011. ^ Center, Bill; Grubb, Shaffer (September 26, 2006). "479" (PDF). The San Diego Union-Tribune. Archived (PDF) from the original on February 23, 2011. ^ a b c d e f g h i j k l "Player Bio Information". MLB.com. Retrieved February 28, 2011. ^ Lowe, John (May 2005). "Troy Percival: A Scouts Insight Helped Launched His Career". Baseball Digest. p. 55. ISSN 0005-609X. Retrieved February 22, 2011. Listed below are the pitchers who have saved 30 or more games in a season for five or more consecutive campaigns. ^ Center, Bill (June 10, 1999). "Hoffman's 200th 'something to build on'". The San Diego Union-Tribune. Archived from the original on February 17, 2011. ^ Krasovic, Tom (August 15, 2001). "Hoffman gets save to join 300 club". The San Diego Union-Tribune. Archived from the original on February 18, 2011. ^ Wilson, Bernie (May 2, 2002). "Hoffman's gone from boos to 321 saves with Padres". A.P. News Wire. ^ "The Secret of San Diego: Why Trevor Hoffman of the Padres is the best closer (ever)". Sports Illustrated. May 13, 2002. Archived from the original on February 18, 2011. ^ Balsamini, Dean (September 19, 2011). "Now it's official: Mariano Rivera is the all-time MLB saves King". Staten Island Advance. Archived from the original on October 11, 2011. ^ "Hoffman Out at Least Half the Season". Los Angeles Times. Associated Press. February 26, 2003. Archived from the original on February 23, 2011. ^ a b c d e Center, Bill (September 26, 2006). "One pitch wound up changing baseball history". The San Diego Union-Tribune. Retrieved September 27, 2009. ^ McCalvy, Adam (March 30, 2009). "Brewers place Hoffman on 15-day DL". MLB.com. Archived from the original on February 9, 2011. Before Monday, he had been on the disabled list only once in his 16-year Major League career. Hoffman missed most of the 2003 season with a right shoulder injury that required surgery. ^ "San Diego 6, Arizona 3". ESPN.com. Associated Press. September 2, 2003. Archived from the original on February 23, 2011. ^ "Trevor Hoffman 2003 Pitching Gamelogs". Baseball-Reference.com. Retrieved February 22, 2011. ^ "Padres Re-Sign Hoffman". The New York Times. Associated Press. November 6, 2003. Archived from the original on February 28, 2011. ^ "Padres re-sign Trevor Hoffman". UPI.com. United Press International. November 6, 2003. Archived from the original on February 28, 2011. ^ "Hoffman moves into fourth on saves list". ESPN.com. Associated Press. June 21, 2004. Archived from the original on February 24, 2011. ^ "Padres snap Giants' six-game win streak". ESPN.com. Associated Press. September 18, 2004. Archived from the original on February 24, 2011. ^ Krasovic, Tom (May 6, 2005). "Hoffman earns 400th save in win over Cardinals". The San Diego Union-Tribune. Archived from the original on February 24, 2011. ^ "Padres Timeline". Padres.com. Retrieved February 23, 2011. ^ "Hoffman named winner of the 'DHL Presents the Major League Baseball Delivery Man of the Month Award' for May" (Press release). San Diego Padres. June 6, 2005. Archived from the original on March 7, 2011. ^ Krasovic, Tom (August 25, 2005). "Hoffman taps history on shoulder". The San Diego Union-Tribune. Archived from the original on February 24, 2011. ^ Krasovic, Tom (October 9, 2005). "Dominating Cardinals eliminate Padres as Williams chased early". The San Diego Union-Tribune. Archived from the original on February 24, 2011. ^ a b "Hoffman to re-sign with Padres for two-year deal". ESPN.com. Associated Press. December 8, 2005. Archived from the original on February 8, 2011. ^ Chandler, Swank 2012, p. 38. ^ "Elias Says ..." ESPN.com. Elias Sports Bureau. August 21, 2006. Archived from the original on February 9, 2011. That broke Roy Face's all-time record for most relief appearances with one club (775 for the Pirates from 1953 to 1968). ^ a b Bloom, Barry (September 24, 2006). "'Trevor Time' reaches immortality". MLB.com. Archived from the original on February 15, 2011. ^ Sullivan, Tim (September 25, 2006). "King of the hill". The San Diego Union-Tribune. Archived from the original on February 24, 2011. ^ a b Bloom, Barry (September 24, 2006). "Colleagues salute Hoffman's exploits". MLB.com. Archived from the original on February 8, 2011. ^ "For The Record". Sports Illustrated. October 2, 2006. Archived from the original on April 19, 2011. ^ Krasovic, Tom (October 1, 2006). "Fittingly, San Diego reaches playoffs with superb pitching, defensive flair". The San Diego Union-Tribune. Archived from the original on February 24, 2011. ^ Krasovic, Tom (October 2, 2006). "Gritty Padres tame woolly West". The San Diego Union-Tribune. Archived from the original on February 24, 2011. ^ "Trevor Hoffman named winner of "DHL Presents the Major League Baseball Delivery Man of the Month Award" for September" (Press release). San Diego Padres. October 6, 2006. Archived from the original on March 7, 2011. ^ Spencer, Lyle (November 3, 2006). "Hoffman picks up Rolaids Relief honor". MLB.com. Archived from the original on March 7, 2011. ^ Branam, Amanda (October 10, 2006). "Hoffman named NL Fireman of the Year". MLB.com. Archived from the original on March 7, 2011. ^ a b c d e f g h i j Center, Bill (January 11, 2011). "Hoffman retires, will wear 'different hats' for the Padres". The San Diego Union Tribune. Archived from the original on January 23, 2011. Retrieved January 23, 2011. Hoffman made the National League All-Star team six times as a Padre and was twice the runner-up (1998 and 2006) in the league's voting for the Cy Young Award. ^ "Padres stave off elimination, beat Cards in Game 3". ESPN.com. Associated Press. October 7, 2006. Archived from the original on February 28, 2011. ^ Krasovic, Tom (October 9, 2006). "No sympathy cards". The San Diego Union Tribune. Archived from the original on February 28, 2011. ^ Krasovic, Tom (April 29, 2007). "Padres find saving graces". The San Diego Union Tribune. Archived from the original on February 28, 2011. ^ Krasovic, Tom (June 7, 2007). "Ring up No. 500". The San Diego Union Tribune. Archived from the original on February 28, 2011. ^ "Trevor Hoffman named winner of the "DHL Presents the Major League Baseball Delivery Man of the Month Award" for May" (Press release). San Diego Padres. June 5, 2007. Archived from the original on March 7, 2011. ^ Center, Bill (September 9, 2007). "Bradley's timetable for return unknown". The San Diego Union Tribune. Archived from the original on February 28, 2011. ^ "Padres wait to clinch playoff spot after 11-inning loss". ESPN.com. Associated Press. September 29, 2007. Archived from the original on January 27, 2011. Retrieved January 26, 2011. Tony Gwynn Jr., son of the Hall of Famer whose statue stands outside the Padres' ballpark, hit a tying, two-out triple off Trevor Hoffman in the ninth inning and the Milwaukee Brewers beat San Diego 4-3 in the 11th on Saturday. ^ "Padres wait to clinch playoff spot after 11-inning loss". ESPN.com. Associated Press. October 1, 2007. Archived from the original on January 27, 2011. Retrieved January 26, 2011. Holliday raced home on Jamey Carroll's shallow fly ball, capping a three-run rally against the all-time saves leader, giving the Rockies a 9-8 win in baseball's longest one-game tiebreaker. ^ Krasovic, Tom (October 13, 2007). "Hoffman has minor surgery on elbow". The San Diego Union Tribune. Archived from the original on March 11, 2011. ^ a b Sullivan, Tim (March 31, 2008). "Hoffman saved by new season". The San Diego Union Tribune. Archived from the original on March 11, 2011. ^ Krasovic, Tom (August 15, 2008). "Bad vibes over radio like music to Peavy". The San Diego Union-Tribune. Archived from the original on February 16, 2011. ^ "Five-run 14th breaks tie, powers Padres past Nationals". ESPN.com. Associated Press. September 19, 2008. Archived from the original on February 16, 2011. ^ "Kouzmanoff starts offense early, Young goes six strong innings against Pirates". ESPN.com. Associated Press. September 27, 2008. Archived from the original on March 1, 2011. ^ a b Krasovic, Tom (September 29, 2008). "Somehow, Padres could never live up to their advanced billing". The San Diego Union-Tribune. Archived from the original on March 1, 2011. ^ Krasovic, Tom (January 7, 2009). "GM Towers on the Hoffman situation: 'We just don't have the money'". The San Diego Union-Tribune. Archived from the original on October 27, 2014. ^ Bloom, Barry; Brock, Corey (November 11, 2008). "Padres withdraw offer to Hoffman". MLB.com. Retrieved September 27, 2009. ^ a b c d e Lemire, Joe (January 11, 2011). "Closing the book on Hoffman's slow, steady, legendary career". SI.com. Archived from the original on October 27, 2014. But Hoffman, master of the changeup, had 12 seasons with at least 37 saves -- a winning career owing to a slow and steady approach, just as the tortoise in Aesop's fable. ^ "Sources: Hoffman, Brewers have deal". ESPN. Retrieved January 8, 2009. ^ McCalvy, Adam (March 21, 2009). "Brewers' Hoffman still on the mend". MLB.com. Archived from the original on September 12, 2011. ^ McCalvy, Adam (April 27, 2009). "Crew keeps cool, pulls out win late". MLB.com. Archived from the original on September 12, 2011. ^ McCalvy, Adam (April 29, 2009). "Hoffman cranks up volume in first save". MLB.com. Archived from the original on September 12, 2011. ^ Haudricourt, Tom (April 28, 2009). "Hoffman's save caps comeback". Milwaukee Journal Sentinel. Archived from the original on October 8, 2011. ^ Shain, Jeff (June 4, 2009). "Hoffman named NL's top hurler in May". MLB.com. Archived from the original on March 1, 2011. ^ Roseberg, Adam (June 5, 2009). "Hoffman nabs Delivery Man honors". MLB.com. Archived from the original on March 1, 2011. ^ "Pierzynski ends Hoffman's streak as White Sox edge Brewers". ESPN.com. Associated Press. June 14, 2009. Archived from the original on March 1, 2011. ^ Haudricourt, Tom (September 3, 2009). "Parra comes through". Milwaukee Journal Sentinel. Archived from the original on March 2, 2011. ^ a b Haudricourt, Tom (September 3, 2009). "Thursday game report: Brewers at Cardinals". Milwaukee Journal Sentinel. Archived from the original on March 2, 2011. ^ McCalvy, Adam (October 5, 2009). "Hoffman agrees to deal with Brewers". MLB.com. Archived from the original on September 12, 2011. ^ a b c d Kepner, Tyler (May 26, 2010). "After 596 Saves, Hoffman Works to Reclaim His Closer's Role". The New York Times. Retrieved June 8, 2010. ^ Haudricourt, Tom (April 28, 2010). "Brewers lose as Hoffman blows another". Milwaukee Journal Sentinel. Archived from the original on March 2, 2011. ^ "2010 Pitching Splits – Trevor Hoffman Stats, News, Photos". ESPN.com. Retrieved June 8, 2010. ^ Hayes, Dan (May 2, 2010). "Hoffman great on Saturday". North County Times. Archived from the original on January 27, 2011. Retrieved January 27, 2011. He's blown 20 of 84 save attempts in April for his career —- a 76.1 percent success rate. The rest of the season, he's converted 531 of 586 attempts —- a 90.6 percent rate of success. ^ Hayes, Dan (May 2, 2010). "PADRES: Hells bells toll for Padres". North County Times. Archived from the original on January 27, 2011. Retrieved January 27, 2011. Trevor Hoffman was trying to earn his first Petco Park save as a visitor, and Bud Black and Adrian Gonzalez weren't there to take in the experience. ^ Gardner, Charles F. (May 30, 2010). "Macha to stick with Axford as closer for now". Milwaukee Journal Sentinel. Retrieved June 8, 2010. ^ a b Lemire, Joe (May 25, 2010). "Hoffman's struggles leave Brewers, star closer at a crossroads". SI.com. Archived from the original on January 27, 2011. Retrieved January 27, 2011. Hoffman, baseball's alltime saves leader with 596, has saved just five games in 10 chances with a 12.21 ERA. ^ a b c d e f g h i j Bloom, Barry M. (January 11, 2011). "All-time saves leader Hoffman retires". MLB.com. Archived from the original on March 7, 2011. ^ Rosenthal, Ken (August 19, 2011). "K-Rod excelling as Brewers' setup man". FoxSports.com. Fox Sports Interactive Media, LLC. Archived from the original on August 21, 2011. ^ a b c Haudricourt, Tom (September 8, 2010). "Hoffman hits 600 save mark as Brewers win". Milwaukee Journal Sentinel. Archived from the original on April 16, 2011. ^ McCalvy, Adam (December 24, 2010). "Saves king Hoffman at crossroads as '11 looms". MLB.com. Archived from the original on April 18, 2011. ^ Krasovic, Tom (February 16, 2011). "Trevor Hoffman Taking His Time Before Delivering Next Pitch in Retirement". AOL News. Archived from the original on March 2, 2011. ^ "Trevor Hoffman's No. 51 to be retired". ESPN.com. Associated Press. June 17, 2011. Archived from the original on August 21, 2011. ^ "Padres retire Trevor Hoffman's No. 51". SI.com. Associated Press. August 21, 2011. Archived from the original on August 21, 2011. ^ Rosenberg, Jason (August 22, 2011). "Meeting baseball's Yoda in San Diego". ESPN Internet Ventures. Archived from the original on August 22, 2011. ^ a b c Hayes, Dan (August 21, 2011). "PADRES NOTES: Hoffman ceremony filled with surprises". North County Times. Archived from the original on August 22, 2011. ^ Sullivan, Tim (August 21, 2011). "Grand gesture is prime Trevor Time for good reason". The San Diego Union-Tribune. Archived from the original on August 22, 2011. ^ Lin, Dennis (August 30, 2014). "Hoffman inducted into Padres Hall of Fame". U-T San Diego. Archived from the original on August 31, 2014. ^ Brock, Corey (January 6, 2016). "Hoffman makes strong debut on HOF ballot". MLB.com. Archived from the original on January 7, 2016. ^ Jaffe, Jeff (January 6, 2016). "Three thoughts on Ken Griffey, Mike Piazza and 2016 Hall of Fame election". Sports Illustrated. Archived from the original on January 7, 2016. ^ Kurkjian, Tim (January 6, 2016). "Manny, Pudge and Vlad top first-time candidates on 2017 HOF ballot". ESPN.com. Archived from the original on January 7, 2016. ^ Lin, Dennis (January 18, 2017). "Trevor Hoffman narrowly misses election to Hall of Fame". The San Diego Union-Tribune. Archived from the original on January 19, 2017. ^ a b c Lin, Dennis (January 24, 2018). "Trevor Hoffman elected to Hall of Fame". The San Diego Union-Tribune. Archived from the original on January 25, 2018. ^ Lin, Dennis (January 26, 2018). "Padres to unveil Trevor Hoffman statue at Petco Park this summer". The San Diego Union-Tribune. Archived from the original on January 27, 2018. ^ a b James, Bill; Neyer, Rob (2004). The Neyer/James guide to pitchers. Simon & Schuster. pp. 244–5. ISBN 978-0-7432-6158-6. Retrieved February 11, 2011. ^ a b c d Schlegel, John (March 4, 2005). "'I needed ... an equalizer'". MLB.com. Archived from the original on September 12, 2011. ^ a b c d e f g h Joshi, Sunil (January 12, 2011). "Respect for Hoffman resonates around Majors". MLB.com. Retrieved January 26, 2011. Basically, it stopped at home plate. Guys hadn't seen a pitch like that, and they couldn't adjust to it. He pitched so well off his fastball they couldn't just sit on it every pitch. ^ Bloom, Barry (April 27, 2005). "Hoffman definitely Hall of Fame caliber". MLB.com. Archived from the original on February 11, 2011. ^ Krasovic, Tom (September 12, 2006). "Pitchers thriving in Balsley ERA". The San Diego Union-Tribune. Archived from the original on March 11, 2011. ^ a b c d e f g h i j k Olney, Buster (January 12, 2011). "Opening up on Trevor Hoffman". ESPN.com. Archived from the original on May 6, 2012. There will be a lot of discussion over his struggles in the postseason and All-Star Games, but those small samples should be completely obscured by almost two decades of incredible regular-season excellence. ^ Kepner, Tyler (January 13, 2011). "Hoffman's Talent Was Not Limited To Pitching". The New York Times. p. B13. Archived from the original on April 19, 2011. ^ a b Crasnick, Jerry (June 2, 2007). "Changeup is the key to Hoffman's success". ESPN.com. Archived from the original on February 8, 2011. He makes it a point to stand at his locker and hold himself accountable on the rare occasions when he fails. ^ Verducci, Tom (June 18, 2001). "High-wire Act". Sports Illustrated. Archived from the original on March 11, 2011. ^ Singer, Time (August 21, 2011). "Black remembers Trevor as a class act". MLB.com. Archived from the original on August 23, 2011. ^ a b c Crasnick, Jerry (June 1, 2007). "Hoffman deserves a plaque in Cooperstown". ESPN.com. Retrieved January 26, 2011. He is the best at what he does and has been for a long, long time. Any time anybody dominates a position (and these days, 'closer' is a position) the way he has done it consistently year after year after year, he gets my vote. ^ a b Kenney, Kirk (January 7, 2015). "Hoffman eager to make entrance". U-T San Diego. Archived from the original on January 9, 2015. ^ a b Sanders, Jeff (January 4, 2016). "Analyzing Trevor Hoffman's MLB Hall of Fame bid". The San Diego Union-Tribune. Archived from the original on January 5, 2016. ^ a b "Greg Holland, Craig Kimbrel named 2014 Relievers of the Year". MLB.com (Press release). October 22, 2014. Archived from the original on October 23, 2014. ^ Pouliot, Matthew (2013-09-03). "Mariano Rivera notches ninth 40-save season". NBCSports.com. Retrieved 2013-09-03. ^ "Well, Hells Bells, Trevor Hoffman Makes It to Cooperstown". The New York Times. Associated Press. January 24, 2018. Archived from the original on January 26, 2018. ^ White, Paul (May 30, 2007). "Confidence game as closer has few winners". USA Today. Retrieved January 26, 2011. That's because closing is baseball's most volatile role. ^ Stark, Jason (January 6, 2016). "Explaining my Hall of Fame ballot". ESPN.com. Archived from the original on January 6, 2016. ^ a b c Simon, Mark (January 11, 2011). "Does HOF await Trevor Hoffman?". ESPN.com. Retrieved January 26, 2011. Only two pitchers have had streaks of four straight seasons with at least 40 saves. Hoffman did it not once, but twice. ^ a b c d e Jaffe, Jay (January 13, 2011). "Prospectus Hit and Run: Trevor Hoffman and the Coming Wave". BaseballProspectus.com. Prospectus Entertainment Ventures, LLC. Archived from the original on March 2, 2011. ^ a b "Career Leaders & Records for Strikeouts per 9 IP". Baseball-Reference.com. Archived from the original on March 2, 2011. ^ Zimniuch, Fran (2010). Fireman: The Evolution of the Closer in Baseball. Chicago: Triumph Books. p. 242. ISBN 978-1-60078-312-8. ^ O'Brien, David (December 7, 2009). "Wagner is Braves' new closer and alpaca expert". The Atlanta Journal-Constitution. Archived from the original on March 3, 2011. ^ Jenkins, Chris (September 26, 2006). "Hoffman Talk". The San Diego Union-Tribune. Archived from the original on March 2, 2011. ^ a b Corcoran, Cliff (September 13, 2011). "Rivera's status as game's greatest closer unlikely to be challenged". SI.com. Archived from the original on May 6, 2012. ^ Short, D. J. (September 17, 2011). "Mariano Rivera ties Trevor Hoffman for all-time saves record". NBCSports.com. Archived from the original on June 13, 2013. ^ "Mariano Rivera: In a class all by himself". 11alive.com. Sports Network. September 20, 2011. Archived from the original on June 13, 2013. ^ a b Stark, Jayson (January 12, 2001). "Trevor Hoffman isn't a Hall of Famer?". ESPN.com. Retrieved January 26, 2011. One of the big arguments used against him is utterly ridiculous. But here it is: He posted 601 regular-season saves. But just four postseason saves. ^ a b c Bloom, Barry M. (December 23, 2015). "Hall will eventually come calling for Hoffman". MLB.com. Archived from the original on December 14, 2017. ^ Lacques, Gabe (December 27, 2016). "Hall of Fame case: Trevor Hoffman will find the Mo to get in". USA Today. Archived from the original on March 7, 2017. ^ Shea, John (January 13, 2001). "Closer Hoffman no first-ballot Hall of Fame lock". San Francisco Chronicle. p. B-2. Retrieved January 26, 2011. He blew a save opportunity in his only World Series appearance (1998 with the Padres) and also failed on two save tries in the final three days of the 2007 season, costing San Diego the playoffs. ^ Borelli, Stephen (September 19, 2011). "Mariano Rivera sets all-time saves record". USA Today. Archived from the original on May 6, 2012. ^ Fordin, Spencer (April 9, 2014). "Yearly relief awards named after Rivera, Hoffman". Major League Baseball. Archived from the original on April 13, 2014. ^ Caple, Jim (August 5, 2008). "The most overrated position in sports". ESPN.com. Archived from the original on February 25, 2011. Retrieved January 26, 2011. ^ a b c Doolittle, Bradford (January 23, 2018). "Trevor Hoffman, Billy Wagner exemplify Cooperstown closer conundrum". ESPN.com. Archived from the original on January 26, 2018. ^ Shaikin, Bill (January 24, 2018). "Trevor Hoffman's election to Hall of Fame gives some relief to San Diego". Los Angeles Times. Archived from the original on January 26, 2018. ^ Acee, Kevin (January 24, 2018). "Trevor's time is also San Diego's time". The San Diego Union-Tribune. Archived from the original on January 25, 2018. ^ Corcoran, Cliff (June 11, 2014). "Jonathan Papelbon's 300th save a fine accomplishment but not a major milestone". Sports Illustrated. Archived from the original on June 1, 2016. ^ Fagerstrom, August (January 8, 2016). "Trevor Hoffman and the Closer's Place in the Hall of Fame". Fangraphs. Archived from the original on February 16, 2017. ^ Mannis, Max (May 3, 2016). "Trevor Hoffman". Society For American Baseball Research. Archived from the original on September 18, 2017. ^ Sanders, Jeff (December 29, 2015). "Friar talk: Early ballot count not in Hoffman's favor". The San Diego Union-Tribune. Archived from the original on January 1, 2016. ^ Posnanski, Joe. "Hell's Bells". NBC SportsWorld. Archived from the original on January 1, 2016. ^ Schoenfield, David (December 22, 2015). "Trevor Hoffman's Hall of Fame case brings up closer controversy". ESPN.com. Archived from the original on January 1, 2016. ^ Bloom, Barry M. (April 5, 2018). "Trevor Hoffman Paves The Way For Great Closers In The Hall Of Fame". Forbes.com. Archived from the original on April 5, 2018. ^ Capozzi, Joe (January 11, 2001). "Hell's Bells — Trevor Hoffman, who started his career with Florida Marlins, bound for Hall after retirement". The Palm Beach Post. Archived from the original on January 26, 2011. Retrieved January 26, 2011. I’ll never forget games I’ve covered at Petco Park when Hoffman trotted in from the bullpen to pitch the ninth inning to the ear-shattering sounds of AC/DC's Hell's Bells — perhaps some of the loudest, most electrifying crowd noise I’ve ever heard. ^ Hunt, Michael (April 28, 2009). "Hoffman fits Brewers like a broken-in glove". Milwaukee Journal Sentinel. Archived from the original on January 26, 2011. Retrieved January 24, 2009. But you will see him emerging from the Miller Park bullpen to the ominous tolling of "Hell's Bells", the AC/DC anthem that first became synonymous with baseball's all-time saves leader during the Padres' 1998 World Series run. ^ Engber, Daniel (April 14, 2006). "Hear My Song, Fear My Fastball". Slate. The Washington Post Company. Archived from the original on January 26, 2011. Retrieved January 26, 2011. The closer songs of the early '90s tended to mix a cranky bravado with the threat of mental instability—don't mess with me, I'm so mean and crazy. ^ Gehlken, Michael (January 12, 2011). ""Hells Bells" Still Ring for Retired Hoffman". NBCSanDiego.com. NBC Universal. Archived from the original on January 26, 2011. Retrieved January 26, 2011. The classic-rock entrance song began in 1998, becoming synonymous with a Padres victory often ending with a devastating changeup — Hoffman's out-pitch. ^ Center, Bill (July 27, 1998). "It's not the same old song for Hoffman". The San Diego Union-Tribune. p. D-8. ^ Peterson, Gary (March 20, 2011). "Baseball Hall of Fame should honor AC/DC". San Jose Mercury News. p. C-2. Archived from the original on March 20, 2011. ^ Daly, Kaitee (July 28, 2010). "John Fogerty's 'Centerfield' sparks a list". ESPN.com. Archived from the original on March 20, 2011. ^ Hoch, Bryan (September 15, 2011). "Cue the 'Sandman': Mariano, song synonymous". MLB.com. Archived from the original on October 8, 2011. ^ "Saves Records". Baseball-Almanac.com. Retrieved September 28, 2011. ^ a b "Games Pitched Records". Baseball-Almanac.com. Retrieved March 1, 2011. ^ Center, Bill (May 6, 2011). "Padres blow it but still manage to walk off winners". The San Diego Union-Tribune. Archived from the original on May 23, 2011. ^ a b Begley, Ian (September 19, 2011). "Mariano Rivera sets new saves record". ESPN.com. Retrieved September 19, 2011. ^ Corcoran, Cliff (January 12, 2011). "Where Hoffman ranks among baseball's best closers ever". SI.com. Time Inc. Archived from the original on March 2, 2011. ^ "Big Savings". Boston Herald. June 9, 2013. Archived from the original on June 9, 2013. ^ a b Carig, Marc (August 14, 2011). "The Yankees This Week: Mariano Rivera drawing skepticism". The Star-Ledger. Archived from the original on August 17, 2011. ^ Lundblad, Jeremy (September 7, 2010). "First Pitch: Ichiro approaching 200 hits ... again". ESPN.com. Archived from the original on March 2, 2011. ^ "Career Leaders & Records for Games Finished". Sports Reference LLC. Archived from the original on August 2, 2011. ^ "In Philadelphia, Lidge Keeps Opposition and Boos at Bay". The New York Times. Associated Press. September 15, 2008. Archived from the original on August 24, 2011. ^ Brock, Corey (August 18, 2011). "Padres, fans set to honor Hoffman at ceremony". MLB.com. Archived from the original on August 21, 2011. ^ Lin, Dennis (February 15, 2014). "Now full-time, Hoffman tackles new job". U-T San Diego. Archived from the original on February 26, 2014. ^ Lin, Dennis (February 22, 2015). "Trevor Hoffman's new title". U-T San Diego. Archived from the original on April 7, 2015. ^ Neumann, Thomas (September 22, 2016). "Inspire, develop, perform: Unheralded British baseball chasing history". ESPN.com. Retrieved October 17, 2016. Wikimedia Commons has media related to Trevor Hoffman.